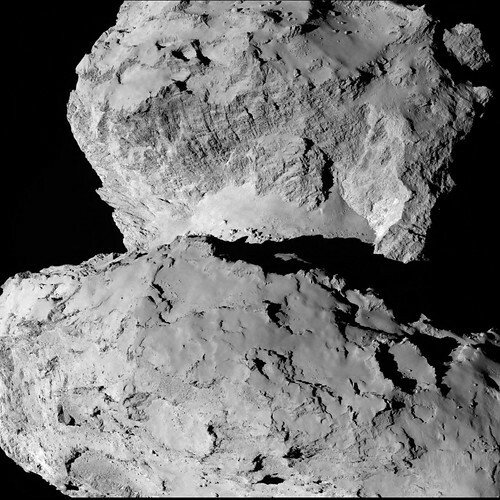 ESA’s Rosetta Mission is sending back some very interesting images, especially for those who were curious about what these big rocks look like. 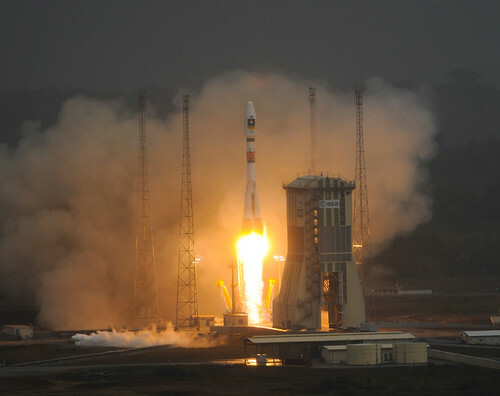 It’s the first spacecraft to rendezvous with a comet. Comet 67P/Churyumov-Gerasimenko imaged by Rosetta’s OSIRIS narrow angle camera on 7 August from a distance of 104 km. 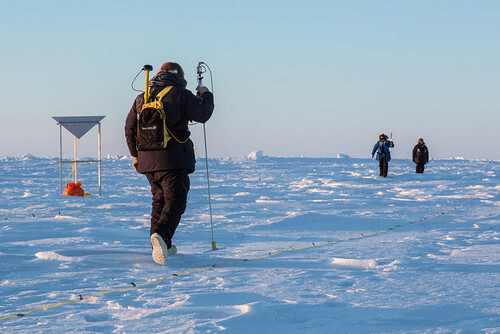 Not as exciting as we’d expect, yet it’s most fascinating. 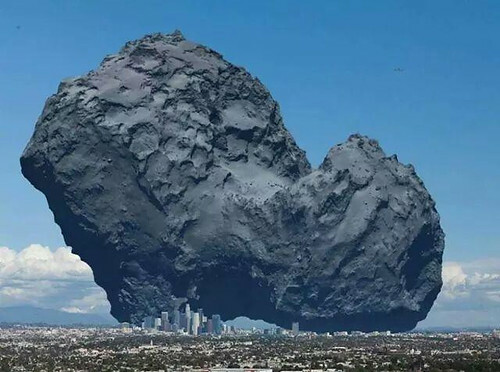 So how big is this comet? Thanks to @quark1972, now we now. 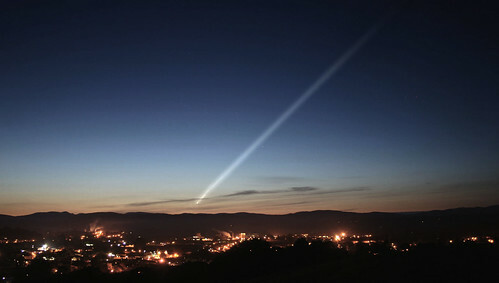 Here’s the comet next to Los Angeles. What a treat: we may be able to see the Comet ISON during the Thanksgiving Day holiday. Look for it near the horizon, but don’t look directly into the Sun (duh). 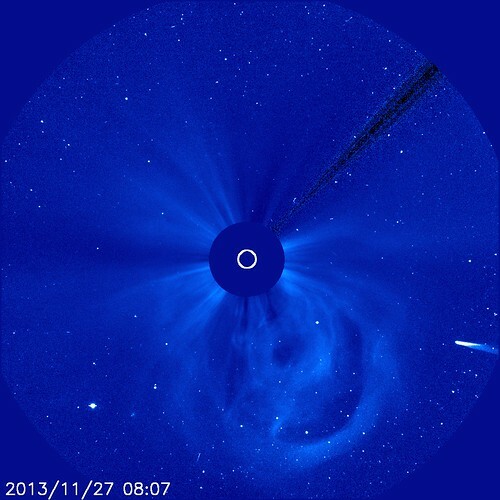 The image above, courtesy of ESA/NASA/SOHO, shows Comet ISON streaming toward the Sun. Comet ISON, which began its trip from the Oort cloud region of our solar system, will reach its closest approach to the sun on Thanksgiving Day, skimming just 730,000 miles above the sun’s surface. NASA is tracking Comet ISON’s journey and hosting events to discuss what the public worldwide may see as the comet traverses the sun. 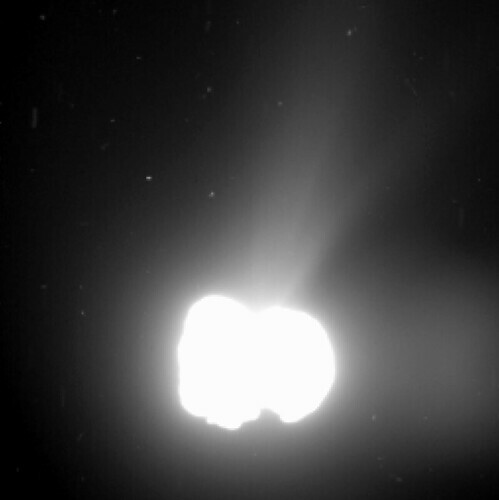 Check out NASA’s Comet ISON Toolkit for more. Think astronomers are excited? That’s an understatement. Look at the observation schedule. 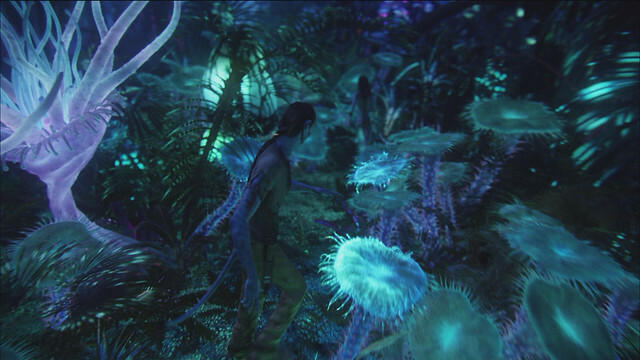 One of many interesting, fantastic details of the film “Avatar” was the bioluminescent plants — and the inter-networked biosystems on Pandora. Remote sensing of terrestrial vegetation fluorescence from space is of interest because it can potentially provide global coverage of the functional status of vegetation. For example, fluorescence observations may provide a means to detect vegetation stress before chlorophyll reductions take place. 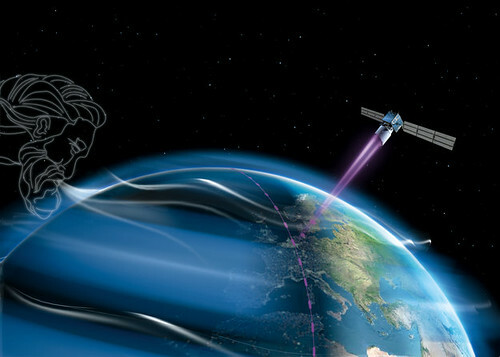 Although there have been many measurements of fluorescence from ground- and airborne-based instruments, there has been scant information available from satellites. 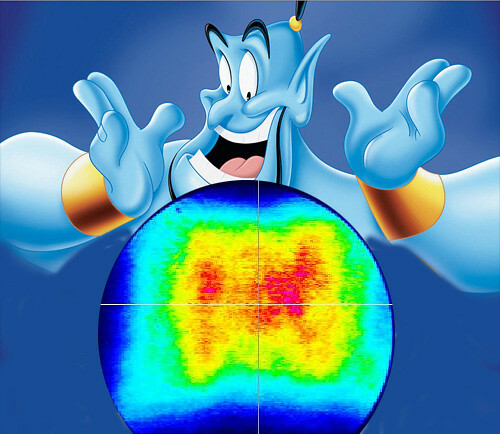 In this work, we use high-spectral resolution data from the Thermal And Near-infrared Sensor for carbon Observation – Fourier Transform Spectrometer (TANSO-FTS) on the Japanese Greenhouse gases Observing SATellite (GOSAT) that is in a sun-synchronous orbit with an equator crossing time near 13:00 LT. We use filling-in of the potassium (K) I solar Fraunhofer line near 770 nm to derive chlorophyll fluorescence and related parameters such as the fluorescence yield at that wavelength. 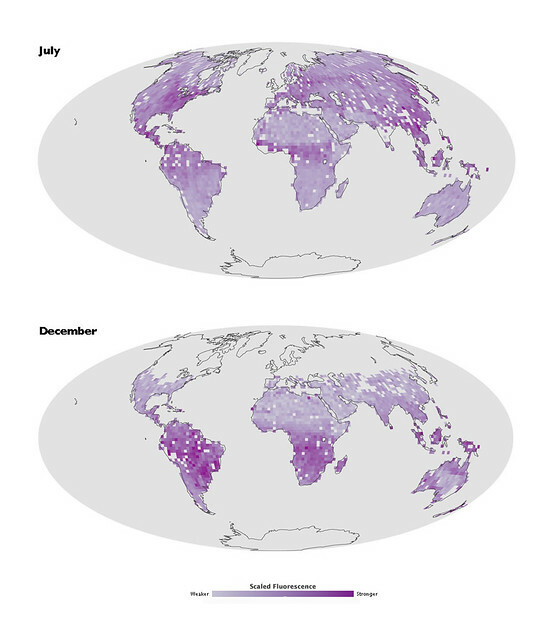 We map these parameters globally for two months (July and December 2009) and show a full seasonal cycle for several different locations, including two in the Amazonia region. We also compare the derived fluorescence information with that provided by the MODIS Enhanced Vegetation Index (EVI). These comparisons show that for several areas these two indices exhibit different seasonality and/or relative intensity variations, and that changes in fluorescence frequently lead those seen in the EVI for those regions. The derived fluorescence therefore provides information that is related to, but independent of the reflectance. Real science is never too far from science fiction, is it? That reminds me: I should water the garden.